There are many aspects to be considered when inspecting construction quality and this article provides material inspection guidelines. For Laboratory testing and sample reporting procedures, refer to EPG 614.3 Laboratory Testing Guidelines for Sec 614. Maintenance planning guidelines for drop inlets, storm sewers and floodgates are also available. 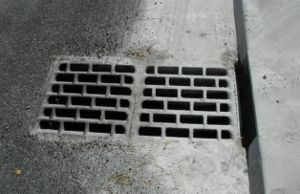 Two types of inlet grates are shown in the standard plans. The curved vane grate (Standard Plan 614.11) is used in roadway and shoulder applications and is considered bicycle safe. The parallel bar grate (Standard Plan 614.10) may be used only in areas outside the roadway and shoulders, such as in grassy medians or other unpaved areas. Standard curved vane grate inlets are 2 ft. long (measured in the direction of flow), and either 2 or 4 ft. wide (measured perpendicular to the direction of flow). Only 2 ft. wide inlets may be used in curb and gutter sections; whereas 2 or 4 ft. widths may be used with integral curb (triangular) sections. Details of the inlet grates and gutter cross-sections may be found in the standard plans. Grate inlets fit in Type S-1, S-2 or S-3 precast drop inlets. Precast drop inlet covers, Types A, B, C, D and E, are shown in the standard plans. Hydraulic aspects of grate inlets are presented in EPG 640.1 Pavement Drainage. Manhole Frame And Cover And Curb Inlet (for Sec 614.30). The Standard Plans are clear. Articles in "614 Drainage Fittings (Grate Inlets)"
This page was last modified on 28 September 2018, at 10:02.